While pretending to sleep, a wife silently watches as her husband, after a “late night at the office”, enters the bedroom while quietly removing his clothes as not to wake her. There is a strong tension in the room, as both members of the married couple are aware of the situation, and it’s this unspoken understanding of what’s going on that is being brilliantly captured by the artist, namely illustrator and Altpick member, Oivind Hovland. 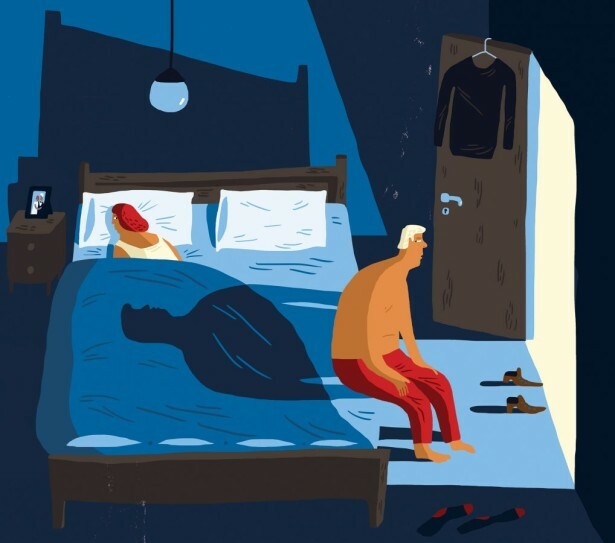 The illustration was created for a recent article about “Infidelity” in Norwegian tabloid newspaper, Verdens Gang. Barbara Kosoff has a New Illustration in the LA Times! ORDEAL Makes the Cover of Applied Arts Annual!